Click here to view additional market update videos. Please contact me if you have any questions about any aspect of the real estate market. I would love to discuss it with you. 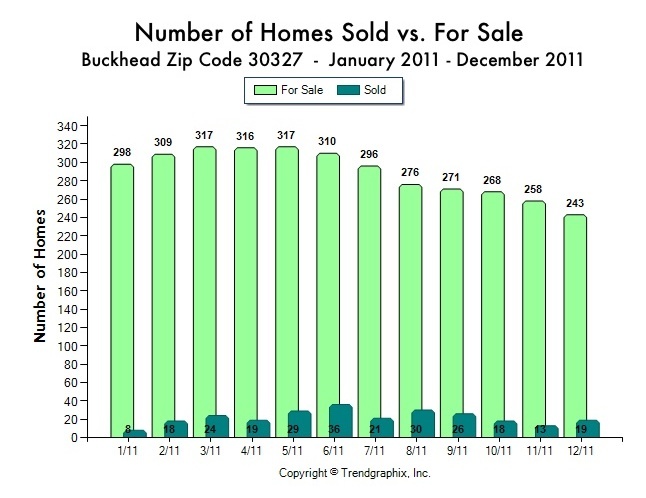 It’s already January 8th and I’m finding a moment to reflect on what trends I saw in the Atlanta real estate market last year and what (in my humble personal opinion) will be happening in 2013 with our housing industry and more specifically in my market areas of expertise – Vinings, Buckhead and Smyrna. As each area of Atlanta seems to have a different feel and velocity, I’ll approach the areas separately. I’ll provide the statistics to back up my opinions on another date as I post them frequently and they only tell one part of the story. I like to say what I see from a grass roots perspective. I know real estate management and even many other bloggers like to paint a rosy picture to get people to “buy” houses, I tend to be much more pragmatic and look at things with an analytical eye, as a homeowner and a mother as to what my clients are feeling and needing. I’ve said this all year, but I believe even more so now. Inventory is low and if you want to sell it is a good time. Almost new with master on the main – so close to Lovett and Westminster. This Vinings home is located at 930 Randall Farm Road. Listed by Tina Hunsicker. I do feel pricing in the Vinings real estate market is still above what many are expecting and I think quite a bit of the inventory will continue to sit unless its adjusted back to about 2000 levels. We were at 1998 levels, so this is good news. Unfortunately, we still have many people pricing at 2005-2007 levels and it just isn’t going to work. Yes, Vinings has great county services, much lower tax levels, it’s a charming Village to live in etc., but pricing can’t be higher than its neighbor across the river in zip code 30327. For the Vinings area, I have investors and builders engaged again. And although they don’t have spec home interest, there is a pent-up demand for new homes specifically for empty nesters wanting to get rid of the Buckhead taxes and their $3M and up homes. Families come to Vinings once they are in private school, but since private schools are eating up alot of their incomes, they tend to look for the more reasonably priced homes, or by Vinings standards, almost starter homes in the $500,000 and $600,000 ranges. There will continue to be deals like in any market, but very rare and far between – and we are are seeing those get bid up when they come on low priced. I just recently found a fabulous deal and it never hit the market, and that’s what I predict will continue to happen with deals as they become increasingly rare. I represented the buyers in the sale of this Buckhead home in the past year – listed at over $1M, home sales like this are indicators of the higher tier market in Buckhead making a comeback. I’m thrilled to say that the higher tier is finally coming back. I believe this demand is fueled primarily by bargain hunters and we won’t see the volume of $3M and up transactions that we used to. There is definitely a building trend going on in Buckhead as older homes are not moving. People that are willing to spend the mulitple millions of dollars want something with high ceilings, open floor plan, basements for kids or storing stuff. I’d say almost 90% of the high end transactions are homes that show like “new” even if they aren’t new. They have to be in A+ condition to command the big bucks. The properties with land, meaning over 2 acres, are tough to find as well. There is definitely a group of people in the under $2M category that are looking for something with land and will pay the higher taxes to have that lifestyle….but there just isn’t any inventory. One of the ways I gage “demand” is the number of emails that circulate around my firm for people with buyers who can’t find anything that’s in the system. It used to be about once every couple of weeks we’d get a “buyer needs” email stating they’d looked at everything on the market and if you have anything that you haven’t listed yet to let them know. Now it seems like we receive one of these emails daily. I also gauge the views online on my listings to see what to expect in showings and there was a sharp spike at the beginning of the year, so I know what’s coming around the corner – showings. Which leads to sales. Located near restaurants and shopping in Vinings, this one at 2714 Vinings Oak Drive was sold in 2012 for a list price of $370,000 by Tina Hunsicker. The price point that’s hot for Smyrna is lower than it historically was. Builders bought foreclosed lots at a deep discount and are putting up new homes in the $300,000 price point, so selling things over $500,000 is tough. When people start getting to the half million dollar price point they seem to have graduated to inside the perimeter. The exception to that rule are those that need more space or really want newer homes with higher ceilings. They’ll still pay over $500,000 to live in 30080. I wish I could convince more empty nesters to consider the small step to OTP. They are very particular and choosy in their neighborhoods as they are afraid their Buckhead friends won’t visit them. So only a few neighborhoods remain acceptable to them. I think we need more upscale neighborhoods just outside of the Perimeter and I propose it goes in the Vinings Heights neighborhood where all the ranches are as its SO close and there is still land there. Unfortunately, those ranches keep getting fluffed up and are becoming too expensive to tear down. Time will tell there as that neighborhood is such a great location to stay as depressed as its been. I think more young people would do well to tear those down, or continue to “fluff” to get the great lots just on the perimeter. I see the lower inventory levels bringing prices up slightly, but I don’t think buyers will jump up in their price point as much as sellers are thinking. If you want to sell it will be easy if priced correctly. If you want to buy, you may have to pay a little more than people did a year ago, but we are still at good low levels. Interest rates are still so incredibly low you have to take advantage of them if you’ve been sitting on the sidelines. Let me know if I can help! Things are hopping in Atlanta and I’m so glad to be busy, and you never know, I may have a buyer in my back pocket just waiting for your house! I was just reading a blog I like on Saturday morning (it was so beautiful in Atlanta on Saturday!!) and I came across this Spring Cleaning list from LilBlueBoo.com. Example: Clean behind and under the washer, dryer and other large appliances. Example: Launder all pillows, bedding and mattress pads. Example: Run cut lemons and ice through the garbage disposal. Example: Clean or replace toothbrushes. Soaking these in hydrogen peroxide is quick and easy! Example: Switch direction of ceiling fans to counterclockwise. Example: Check the dryer exhaust pipe. Example: Update your family emergency kit. I do have a little tip that I’ve just started doing with my ice maker. The intake is so hard to clean that I’ve bought filters to put on the exterior in front of the intake that I can easily replace without taking the grill etc off. Its so low to the ground no one can see it and with a pet in the house (even though he supposedly doesn’t shed), there still seems to be alot of hair and dust that get sucked in there and it seems like I have to have it repaired every year, so maybe this will help. So after reading this blog I decided others may like this list as well. I’ve already done the closets with summer coming so early this year and have started the summer flowers, but there are alot more things to do. Take a look and I always welcome other ideas and may add some myself as I continue on my spring cleaning. Click here to open and print the Mother of all Spring Cleaning Checklist. In compiling statistics for Buckhead’s most elite zip code, 30327, it is harder to elaborate on each house sold since the volume is so much higher. 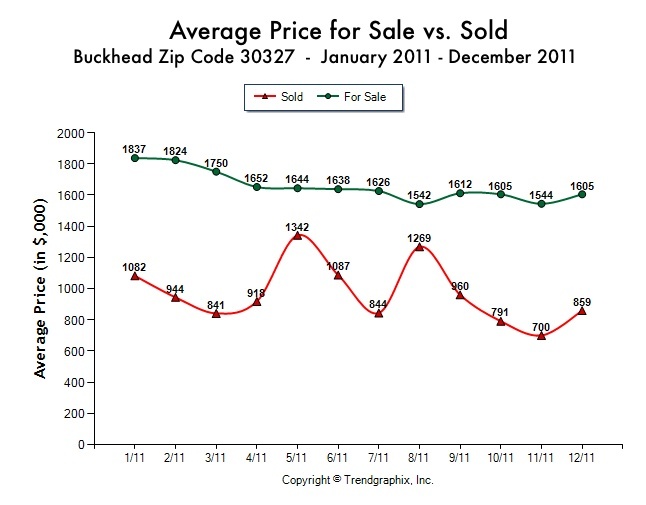 I have a few comments here and then charts below with more information about real estate trends in Buckhead during 2011. 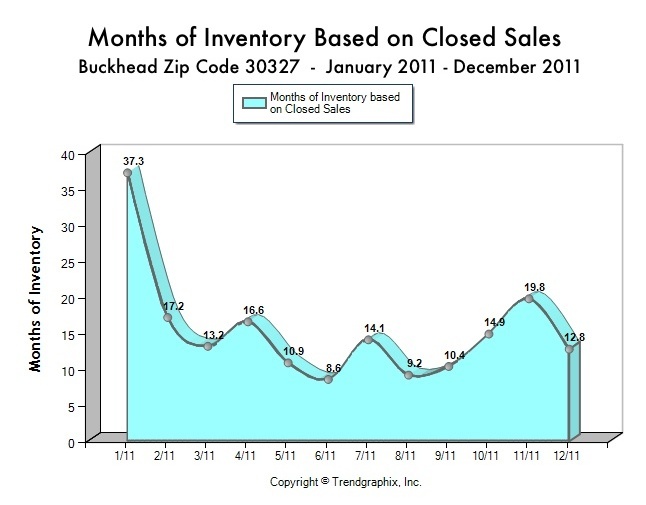 First and foremost as I’ve mentioned before, inventory continues to decrease in Buckhead. Even though prices are still soft, but not declining further, it looks like we are headed into a much more stable market as inventory levels are under 12 months. The trend is decreasing for foreclosures and we’re seeing less and less of them. The other interesting thing to note is that where the average price point is for homes that are for sale is almost double where the average price point for what is selling; that tells us something too. The product on the market is priced higher than where the buyers are. With mortgage rates under 4%, around 3.75% right now, people can trade up in their homes if their current house will sell. The problem is that if they sell their current houses at where the market demands they are losing equity and don’t have the 20% to put down on the next house and most Jumbo mortgages are still requiring 20% down. The exception to that scenario is for doctors. I’ve sold quite a few properties to doctors this year and they can still get 95% loans with certain conditions. So if you’re reading this and you are a doctor, it is the perfect time to buy! For the Atlanta real estate market to turn into a sellers market we’d have to get inventory levels to about 6 months. However, at various price levels I’m receiving emails daily asking if I have anything coming on the market that isn’t on yet. These inquiries tell me that there’s pent up demand and good homes that are priced to the current market will sell pretty quickly. I’m glad to pull specific neighborhoods, streets, price points, etc. for you to look at homes that are listed for sale in the Buckhead market (or anywhere in Atlanta!) if you’re interested. I know most of us don’t like what our houses are worth today and if you’re still wondering, I can run a Case Shiller index for you, pull neighborhood comps etc. It’s usually not as bleak as Zillow suggests! Happy New Year! 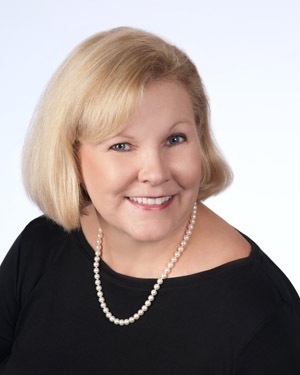 I sat down to come up with my business ideas for 2012 and thinking creatively how to sell my listings in Vinings, Buckhead and throughout Atlanta. In thinking back to the buyers I worked with this year, one common theme runs through all the homes that they were interested in – Light and Bright. This kitchen is on the back of the home and lets in a lot of natural light, there and into the family room. Back when I started in real estate – now a decade ago, I remember a very experienced agent telling me something that stuck with me “light and bright sells”. That idea runs through staging a house for sale and time of day to shoot a house for pictures. Open the drapes – or remove them entirely like my listing at 1655 High Trail in Rivers Call. Often I have my client take down draperies that are blocking any sunlight. They may have spent thousands on having them made, but when we’re showcasing a house for a buyer, the more light the better! One of my recent buyers was very interested in making sure the back of the house was south. Since most kitchen and family areas are on the back they would tend to get the most sun. I actually got her a “happy light” for Christmas as she truly believes that light affects her moods and she’d have to undergo light therapy if her house didn’t face the right direction! I’m thinking that in a bad economy people want to feel happy and light and bright houses help accomplish that. helping clients make their houses more “still” and cut down on “busy”ness to give them a calm feeling. not putting granite in a kitchen in at least 4 years! Without a lot of new construction out there the latest styles are not seen as often, buyers are having to make changes to update their homes. Lori believes in marbles, wood, concrete and other products like that. I do see some of the builders still using products that they were successful with 5 or 6 years ago. Even my most traditional buyers want wide open, bright spaces. Sometimes that may mean cutting back trees or limbing them up on resale houses, as we all tend to like the trees in our yards, but as they begin to block windows, it is time to move them or cut them down. I represented the buyer in the purchase of this East Cobb home at 326 Greyhaven Lane. Key to the sale was the interior light of the home, which was newly built in 2011. Lori Tippen, an interior designer helped my client to change paint colors and add lighter elements throughout the home. I’ve sold two new construction houses in metro Atlanta since December 2011, and both were sold due to the light and bright feeling. One was very European feeling (Laurel Drive) with a wall of windows in the kitchen and hardly any upper cabinetry, but the feel of this room and the level backyard with a South Beach feel is what emotionally attracted the client to this home. The other home I sold in December 2011 was in East Cobb (326 Greyhaven Lane) is the one that has good light, but Lori had to help my client with changing paint colors converting to marble etc. 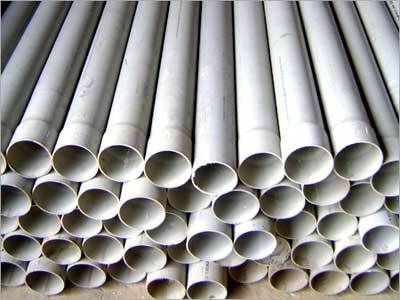 PVC pipes are being used in new construction rather than expensive copper tubing, which is subject to being stolen. Another item that is a new material I’m seeing in these homes is PVC supply plumbing. The first time I saw this I was shocked, but the inspector assured me it was OK, then when I saw it again in the Greyhaven house I was more prepared. With copper prices so high and the fact that the copper is actually being ripped out of the walls during construction, builders are moving to this type of plumbing. The jury is still out on it in my mind, but the inspectors say it will be fine. Another aspect of this light and bright “need” is that I have definitely seen a real need for contemporary houses. The traditional houses that are all over Atlanta, are not what many younger buyers, clients from other countries and those moving in from out of state are looking for. I think I’ll feature this desire for more contemporary style architecture in Atlanta in a future Blog Entry as it’s a pretty important new trend. I’d love to have any ideas you have on helping homes become light and bright! I put a new roof on my house last year and installed radiant barrier under the shingles. I can feel the difference in my upstairs rooms. Check out the article below from Chris Curles and Associates of InfraRED Home Inspections of Atlanta. There are several ways to keep your cool when electrical bills make you a little hot under the collar during warm weather months. A cool roof lowers electrical bills and keeps a home more comfortable by reducing the amount of heat that is transferred inside. Cool roofs are designed to maintain a lower roof temperature while the sun is shining. There are a number of ways a cool roof can be created, including the installation of radiant barriers within the attic as well as radiant shingles on top of the roof. Radiant heat travels in a line and heats anything solid within its path. When the sun heats a roof, it is the sun’s radiant energy that makes the roof hot. A large portion of this heat is conducted through roofing materials to the attic side of the roof. The hot roof material further radiates the heat energy onto the cooler attic surfaces, including the air ducts and the attic floor. This heat will continue to be conducted down through a home’s walls and ceilings into the rooms below. Radiant barriers in an attic. A radiant barrier in the attic can reduce the amount of heat that is transferred from the underside of the roof to the other surfaces in the attic. Such a barrier is effective because of its ability to reflect back the radiant heat rather than allow its further transmission to areas below. Most barriers available today have a reflectiveness of 95 to 97 percent. 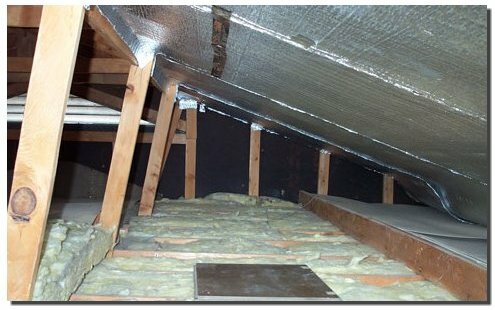 Radiant barriers are more effective in hot climates than in cool climates, especially when cooling air ducts located in the attic. Some studies show that radiant barriers can lower cooling costs between 5% – 10% when used in a warm, sunny climate. The reduced heat gain may even allow for a smaller air conditioning system. And the greater the temperature difference between the sides of the radiant barrier material, the greater the benefits of a radiant barrier can offer. In cool climates, it’s usually more cost effective to install more insulation than a radiant barrier. Some of the most popular names in radiant barriers/solar foil include Attic Foil, eShield, Prodex, Green Energy Barrier, SolarGuard and Reflectix. 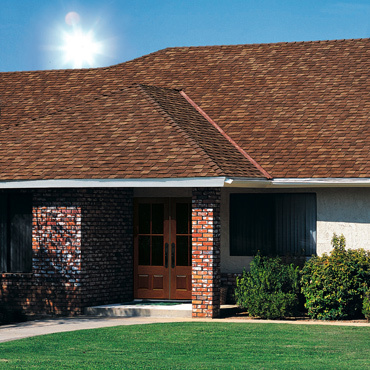 Landmark Solaris™, a new solar reflective roofing shingle. 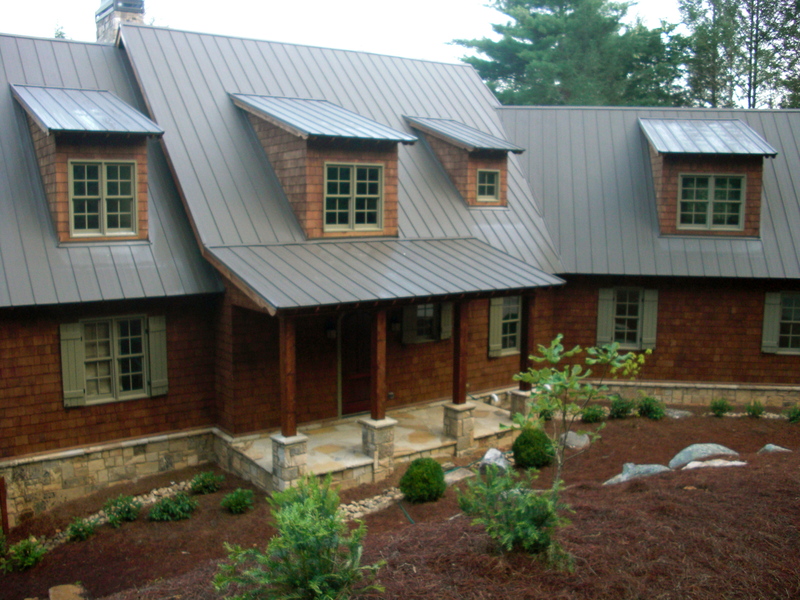 Reflective roof shingles can also greatly reduce the warming effects of the sun by reflecting heat upwards. Although white materials tend to be good solar reflectors, colored roofing materials can also be made to reflect more sunlight. More than half of the sunlight reaching the earth is invisible to the human eye, and even though it is visually undetectable, this invisible sunlight still beats down on and heats our roofs. A colored surface that reflects much of the invisible sunlight is called a cool-dark color, or cool color. A cool-dark color reflects more sunlight than a similar-looking conventional dark color, but less than a light-colored surface. For example, a conventional dark colored surface might reflect 20% of incoming sunlight, a cool-dark colored surface, 40%; and a light-colored surface, 80%. Currently, Landmark Solaris, Owens Corning, GAF, and 3M, among others all manufacture reflective roofing shingles in cool, dark colors. Both radiant barrier material and some reflective roofing shingles qualify for an energy tax credit of up to $500 under the Tax Relief, Unemployment Insurance Reauthorization and Job Creation Act of 2010. “Flipping Out” – Cottage Industry Construction should be the next star! Maybe you’ve watched the television show Flipping Out on Bravo, maybe not. I get a kick out of it because sometimes when I’m dealing with (or a client is dealing with) builders and designers we probably feel how the star, Jeff Lewis, often feels in this program. 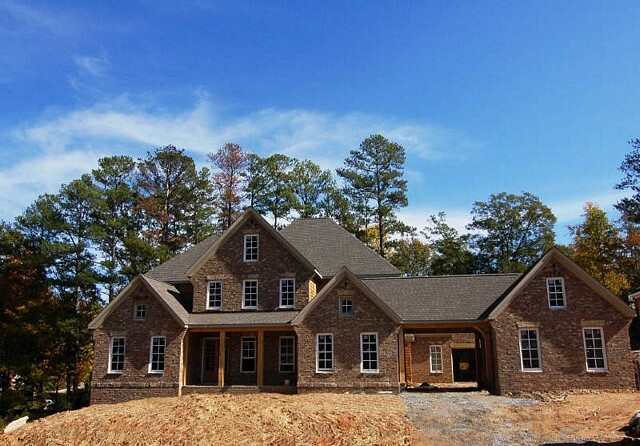 A custom home built by Greg DeLoach of Cottage Industry Construction in Atlanta. I have a real life Vinings/Buckhead answer to the remodeling/building nightmares: Cottage Industry Construction, owned by husband/wife team Lauren and Greg DeLoach. They have been friends and clients of mine for years. Greg is a builder with a building degree from Georgia Tech and Lauren is a designer with a degree in Interior Design from the University of Georgia. Lauren regularly works with Greg’s clients drawing plans, space planning and making selections. Greg is amazing at keeping the project on time and on budget. Everyone will have to sell their house someday and I often get calls when people are remodeling or building wondering what a prospective buyer’s preference would be, or asking me how important something is. Greg and Lauren have a sense of what needs to be done at what price point with houses. 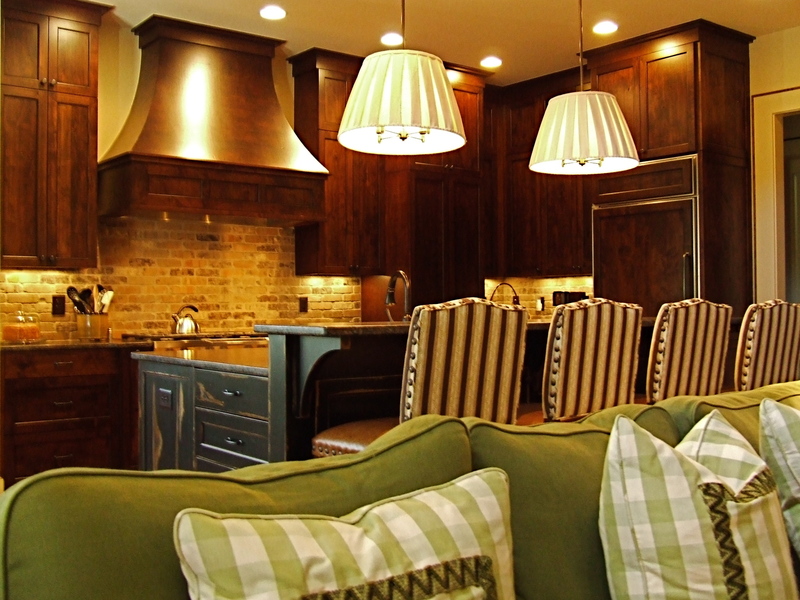 She can select lighting fixtures for a $300,000 house or a $3M house and make them both look timeless and current. On the TV program, Jeff Lewis does both design and building as well and he has a staff that he’s constantly firing or having issues with because it really is a tough job to marry the two. Trying to keep on schedule (and on budget) is always a challenge and by working with a couple that is literally married I think the builder gets the answers he needs a lot quicker from the designer! Greg, Lauren and I had a standing joke that I could sell all of their houses in “1” day. I think it took 3 days one time. Anyway, their talents of building, design and experience are worthy of making note. I want the DeLoach’s to start their own TV program, and of course I want to be the agent to sell all of their gorgeous houses! Cottage Industry Construction has two projects going on in Buckhead currently, joining with great names in architecture locally. I’m sure you’ll be seeing a lot more of them in the future. I’m including some pictures and their contact information if you know of someone interested. 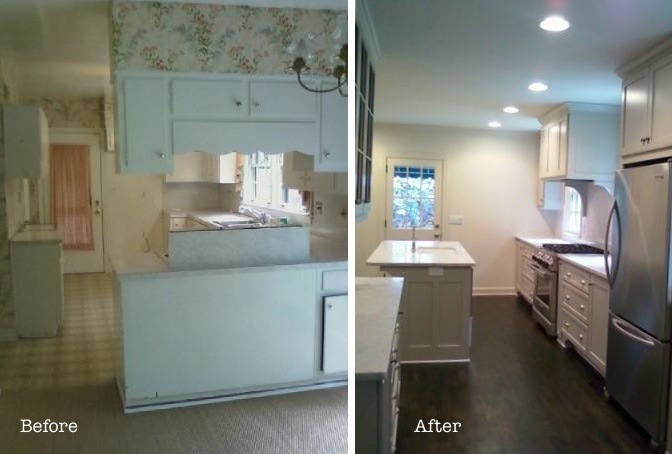 A picture of a kitchen before and after, benefitting from the work of Cottage Industry Construction. 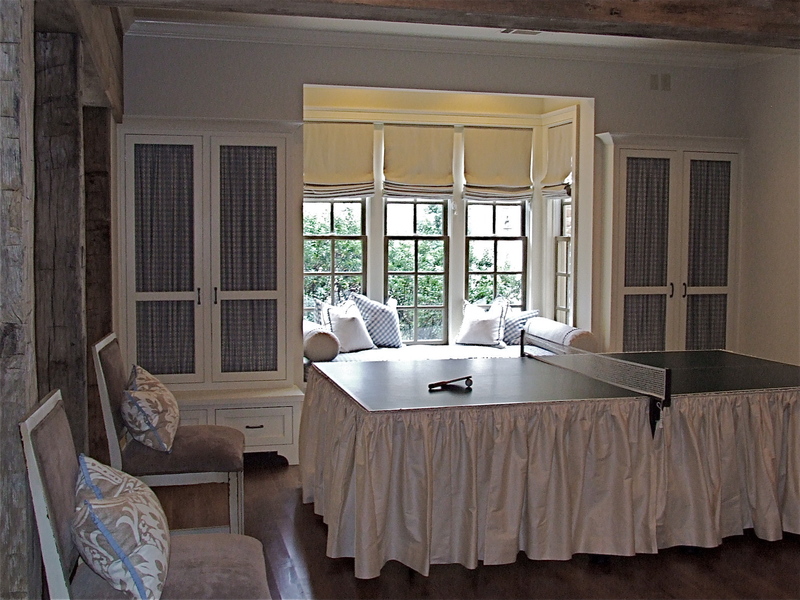 The most elegant ping pong table I have ever seen. Beautiful! 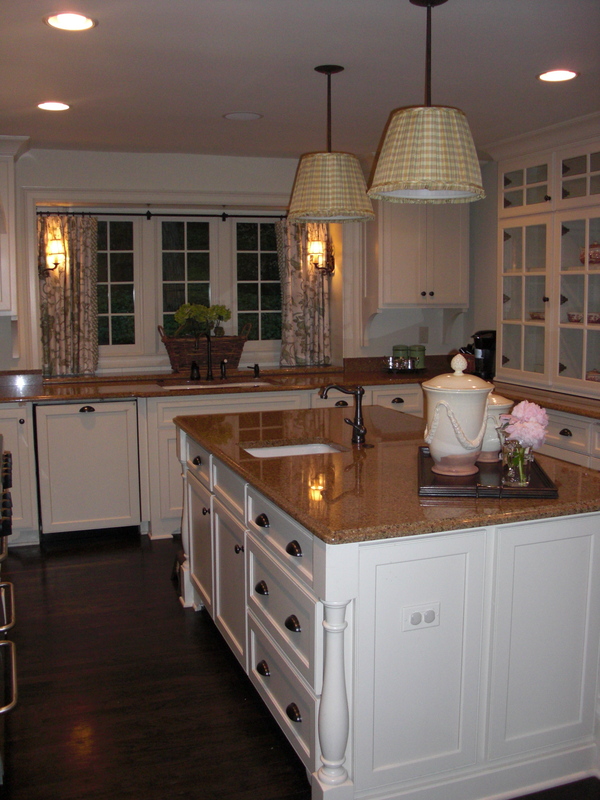 A kitchen designed and remodeled by Lauren and Greg DeLoach of Cottage Industry Construction in Atlanta. A sophisticated and warm kitchen. Love the chairs at the bar! 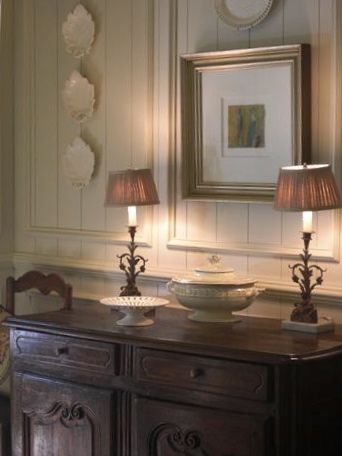 A lovely, inviting entry way designed by Lauren DeLoach of Cottage Industry Construction. When I show homes to clients, the front landscaping as well as the architectural look and proportions are the first two things a prospective client sees. I am a big believer in NO deferred maintenance but also first impressions. One mistake I often see people do is save their landscaping till the last thing they do in a home…even after interior decorating. Or they leave things “natural” instead of landscaping which doesn’t help exhibit the size of the lot. Often when I show property to a married couple, I notice the husband will immediately checks out the backyard, basement or garage (while the wife focuses on the first floor flow and kitchen). Before you consider remodeling inside, look at your yard and try to see it from a potential buyer’s eyes. This Vinings home features beautiful, lush landscaping. 1. In a very high percentage of situations most homes need “some” yard. Yard can be achieved in a number of ways. Atlanta has so much topography that we are used to being creative. The “yard” doesn’t have to be in the back, it can be on the side or front, but it should be screened for privacy. 2. No matter how long you’ve been in the home, now is the time to do the privacy screening. Leland Cypress trees are a great way to have an economical and private yard. They are called the “green fence”. Even if they are little Leland cypresses or magnolias, in 10 years your home will have privacy, so start now while it’s relatively cheap. Don’t wait to do the huge master plan as too often that just doesn’t happen. You can add things every spring or fall that aren’t expensive and in several years you’ll have a fabulous yard. 4. If you own a “mature” yard, screening is probably great, but you may lack sun. I like to see a yard with great screening as long as the plantings look fresh and manicured. That may mean chopping large plantings back dramatically in winter to keep a groomed appearance. 5. Don’t allow bushes to cover windows from an aesthetic and safety perspective. Often when I list houses I have to have them do major chopping back of plants. Also, it’s helpful to check back there for deferred maintenance, especially wood rot. I have now lived in my house in Vinings for over 10 years, and every year I take a look and try to determine what would need to be done if I were to put my home on the market. An annual home review provides a fresh perspective and keeps maintenance up. If you want a second opinion of your home, or are unsure of the maintenance areas you should concentrate on, ask me for a referral to a home inspector. They can make a punch list for you and point you in the right direction. You are currently browsing the archives for the Preparing Your Home For Sale category.